This blog post is kindly sponsored by POMI, all thoughts and opinions are my own. 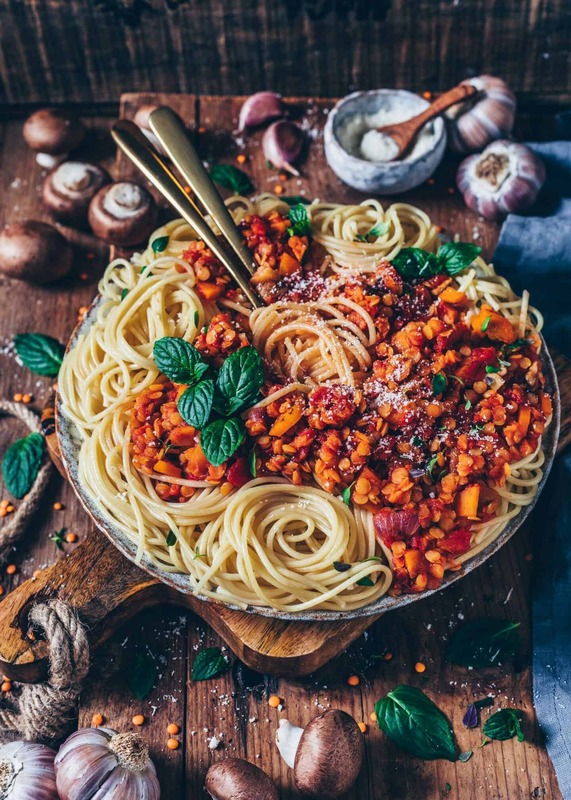 Bolognese is one of my favorite sauces for pasta, and I’ve always loved it. 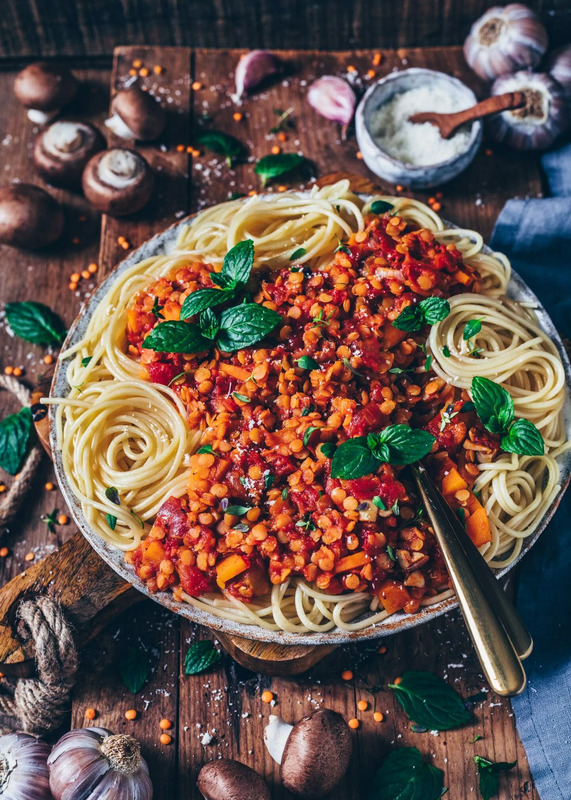 Since I created my own meatless version, I make it very often because it’s such a simple meal that is also perfect to make ahead. 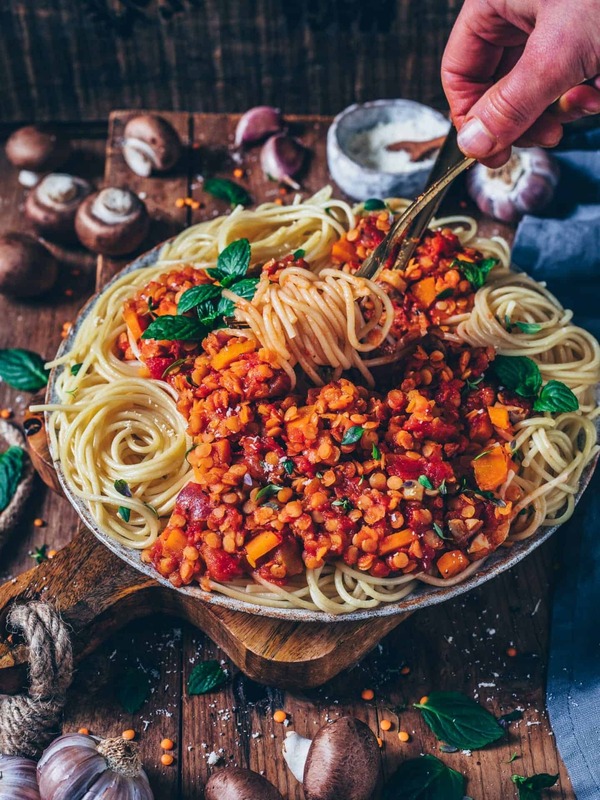 You can simply cook a big batch of this mushroom and lentil bolognese sauce to freeze in meal sized portions, either for your whole family or as individual single serves. 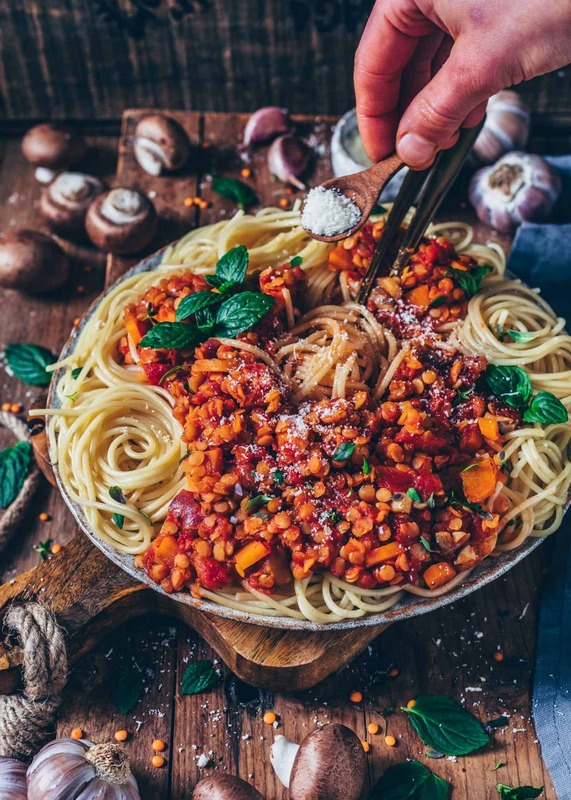 It’s a super easy way to get a healthy meal very fast, if all you need to do is to cook some pasta and defrost some sauce. 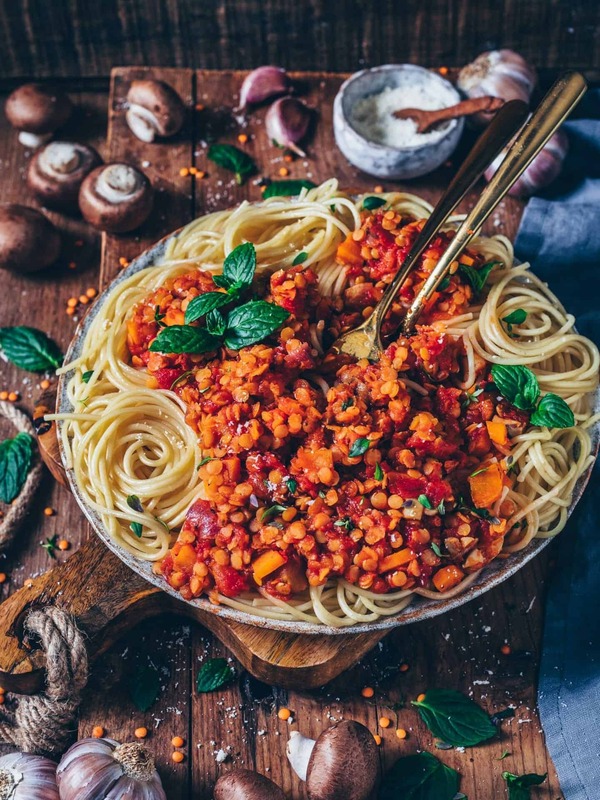 This vegan lentil bolognese with mushrooms is far from traditional and includes a lot of vegetables. I always start with the traditional basic combo of sautéed onion, roasted garlic and some spices for the flavor. 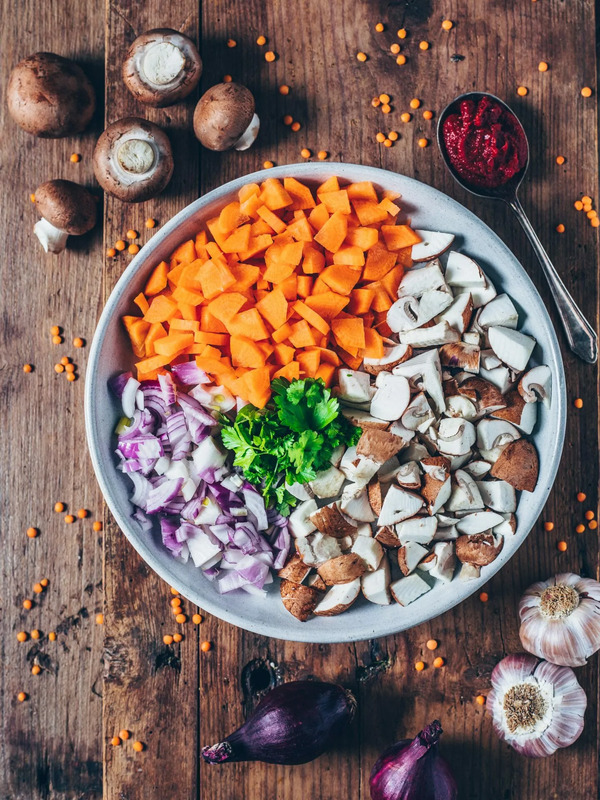 Then adding healthy veggies, such as carrots for texture and natural sweetness. (You could also add celery or other veggies if you like). 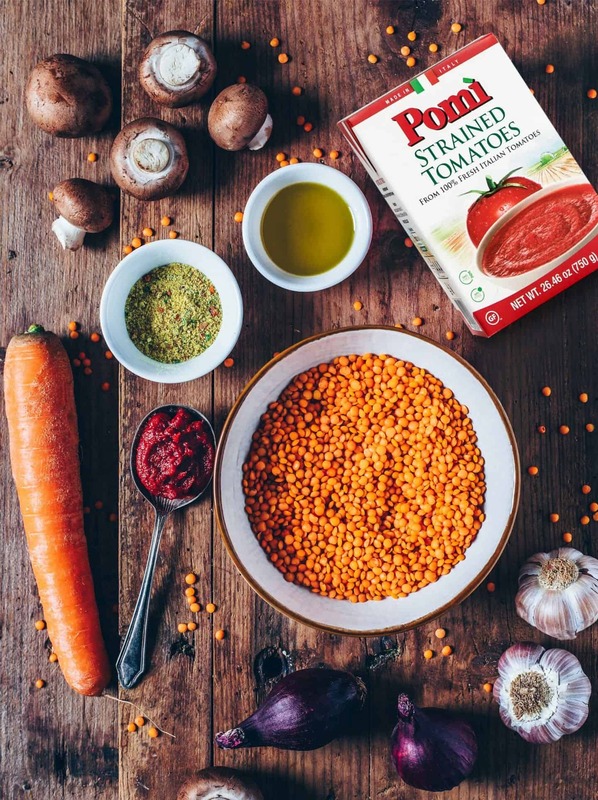 I also added red lentils for plant-based protein (nearly 25 g protein per serving!) 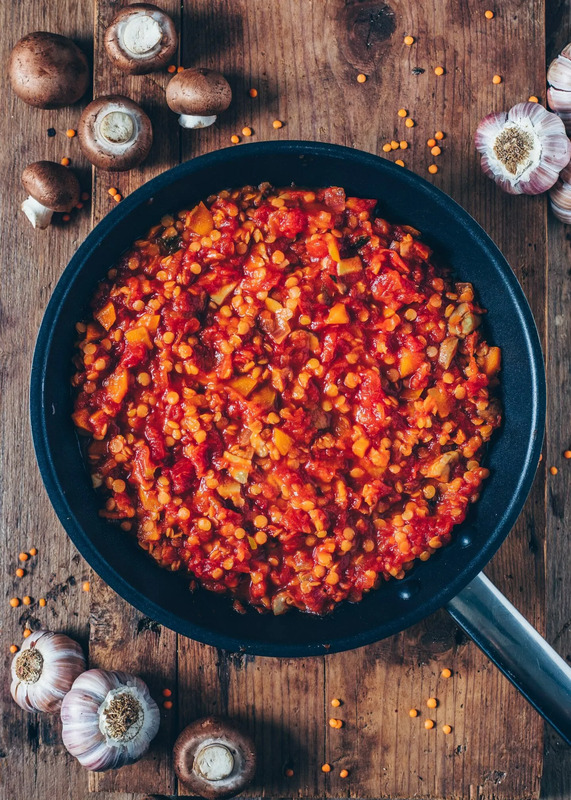 and finely chopped mushrooms, which create a ‘meaty’ texture so you definitely won’t miss the meat in this delicious vegan Lentil Bolognese! 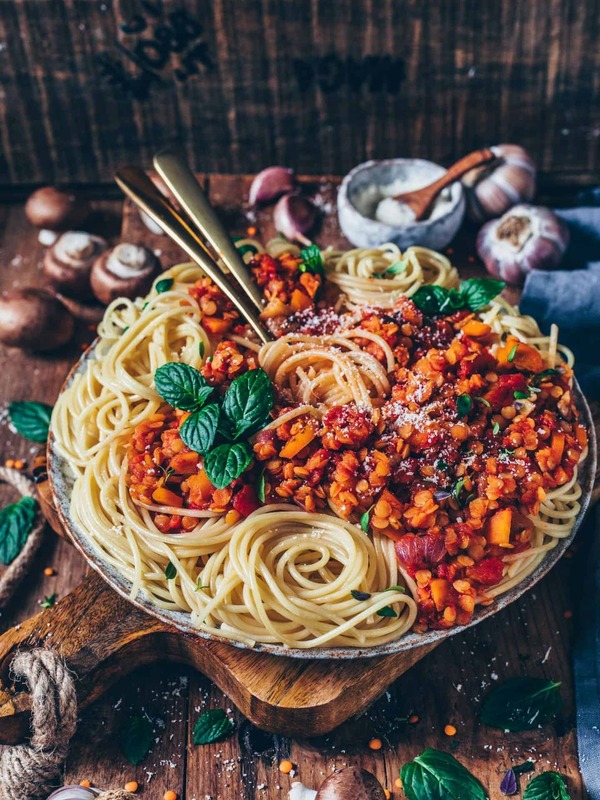 Another important ingredient for a delicious juicy vegan Bolognese sauce is tomatoes. You can choose between using fresh tomatoes or canned. 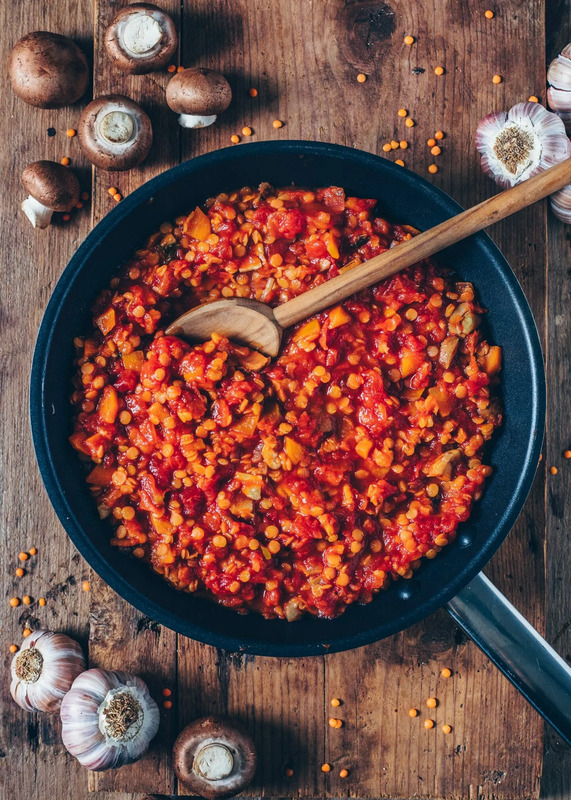 Since tomatoes are not always in season and to keep it more simple, I personally prefer to use canned tomatoes which have a recyclable package. I like the texture best when mixing puréed tomatoes and chunky tomatoes. Anyways, I always recommend to choose sun-ripened tomatoes, such as the Italian tomatoes from Pomi, because, I think, they have the best flavor. Heat oil in a skillet (or pan) over medium heat. Add the onion and sauté until translucent, about 2 minutes. Stir in the carrots, (celery if using), mushrooms, salt, and pepper. Sauté until mushrooms have cooked down and are turning golden, about 5-7 minutes. Add tomato paste, spices and garlic. Roast for about 1-2 minutes longer. Then add lentils, tomatoes and vegetable broth and stir to combine. 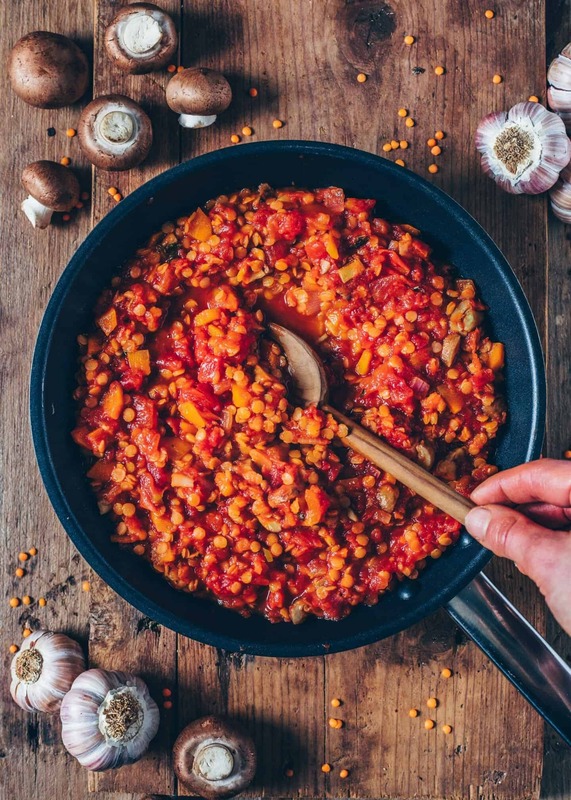 Bring to a boil, then cover, reduce the heat to low, and simmer for about 15-20 minutes, until lentils are done and the bolognese sauce is thickened. Adjust consistency by adding more water if needed. Taste and adjust salt, pepper, and spices. In the meantime, cook the spaghetti (or other pasta) in salted water until al dente, then drain. 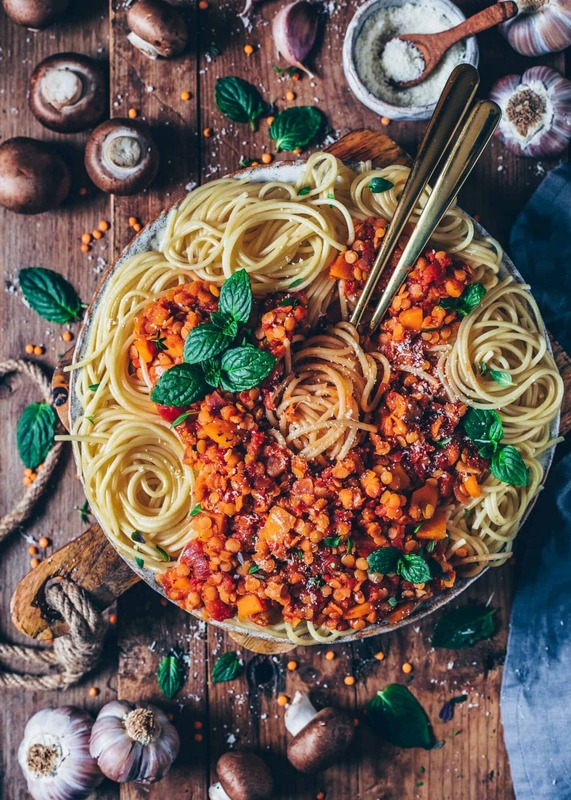 Serve the lentil bolognese sauce over the spaghetti. 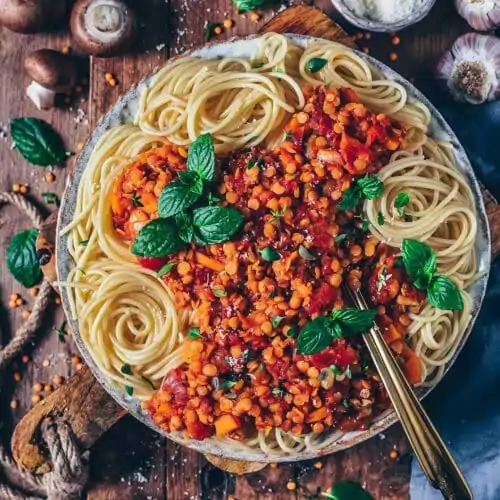 Garnish with vegan parmesan cheese or yeast flakes and fresh herbs if you like. 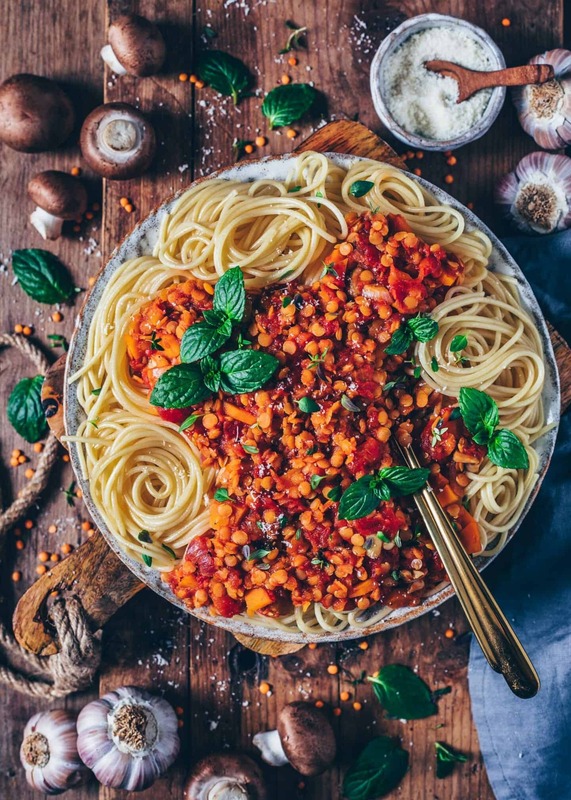 For a lighter option, you can use zucchini noodles, sweet potato noodles or spaghetti squash. I used these strained tomatoes and these finely chopped tomatoes. Thanks for this recipe and let me share with my wife…!!! I love this recipe!! Can you make it in a slow cooker? What do you recommend?